← Lola Maria Restaurant’s Refreshing Halo-halo Bar! Laing in 2 Ways is made from taro leaves, pork, shrimp paste and coconut cream topped with adobo flakes, served original and crispy. Hubby liked the original version, while I preferred the crispy version. We had this at Mesa Filipino Moderne last February 2 during part 2 of my birthday celebration. Mesa Filipino Moderne is located at Level 2, Mega Atrium, SM Megamall. This entry was posted in Food Trip Friday, Mesa Filipino Moderne. Bookmark the permalink. yum! would like to try it, too! May kitchen blog ka na din pala ate. That looks tasty. Never tried it crispy yet, but it looks yummy too! sounds interesting and delicious…would love to try it someday! happy Friday and happy cambodian new year! 🙂 –PinayMum – Mommy’s Life Around…! Hi ate, added na kita sa list, check mo na lang mwah! i haven’t tried laing at Mesa. the one with adobo flakes sounds interesting. that looks yummy.. and thanks for taking to visit my salad entry! happy ftf! Which one is better, the regular or the crispy one? Parang parehong masarap eh! Congrats on your new blog Tetcha! I don’t know how you and Pehpot do it, bilib ako sa juggling act niyo! Oh, yummy! I’m not sure about the kids but I like Laing! ayay! never pa akong nakatikim nang laing…mukhan masarap…sowe po sa late visit…thanks for dropping by! 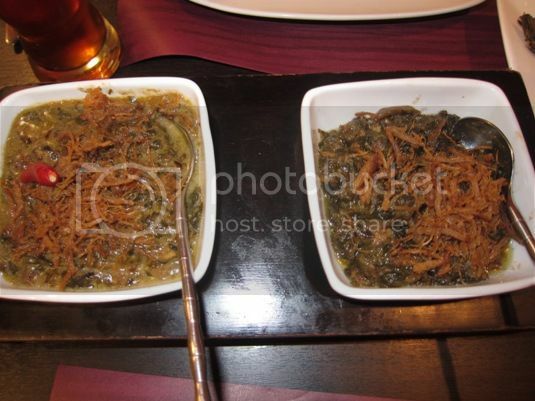 this post makes me crave again for Laing.. so love! wow laing is my favourite! specially if it is very spicy!! i should try to cook one for my self very soon! started to crave for it now! shucks it’s been a while since I had laing.. pero I want my laing not that spicy.. hindi ko kayang kainin pag sobrang anghang na.. Thanks to my mother who comes from Bicol, I acquired a taste for laing. I really love it. I love Laing, but I don’t like if it’s too spicy (di na makain). Sa picture mo, which one is the original version?